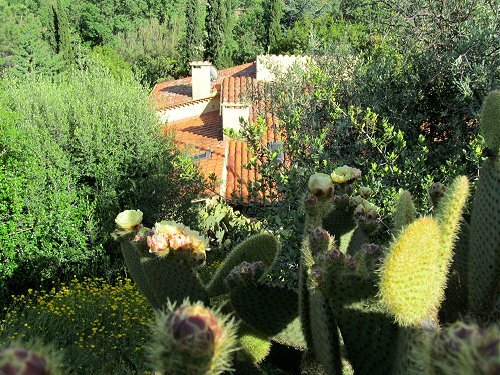 My header photo shows the studio of the French Catalan artist Aristide Maillol outside Banyuls sur Mer in France. 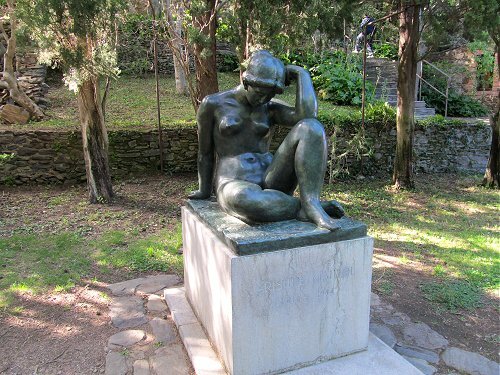 Maillol (1861-1944) and Rodin were the two most influential figures in twentieth-century French sculpture, and the studio at Banyuls is now a small museum which compliments the much larger collection of his work in Paris. The artist had a penchant for large-thighed ladies, and his last model and muse Dina Vierny was almost sixty years his junior. Malliol is buried in the grounds of the museum beneath his best known sculpture La Méditerranée, see footer photo. The Mussée Maillol is tucked into a valley in the foothills of the Albères, the range that forms the border between France and Spain. A track that links the two countries by crossing the 360m high Col de Banyuls passes close to the museum. This path has been used since Roman times, and more recently was an escape route known as le chemin de la liberté. First it was followed by Spanish Republican refugees fleeing from Franco's fascist forces in 1939. Then the tragic human tide was reversed and it was the route to safety for Frenchmen fleeing another little-known blot on France's humanitarian record Service du travail obligatoire (STO), the Vichy government's forced enlistment and deportation of hundreds of thousands of French workers to Nazi Germany to work as slave labour for the German war effort from 1942 onwards. 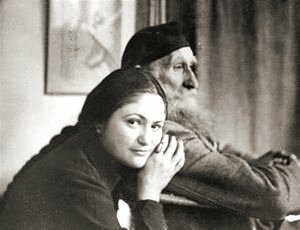 Dina Vierny (1919-2009), who is seen above with the artist, was Aristide Maillol's last muse, model and platonic companion. She was born into a musical and politically radical Jewish family in Moldova. Her father was an Odessa Jew and pianist with anarchist leanings who had been exiled to Siberia, and she described her aunts as “demoiselles nihilistes.” In the 1930s Vierny was a member of the Marxist agitprop political theatre group Octobre under the leadership of radical poet Jacques Prévert, and she also sang in Paris with émigré Russian Roma cabaret singers. In 1939 Dina Vierny began working for the French resistance in Paris before moving to Banyuls to model for Maillol. In Banyuls she was approached by Varian Fry, the American journalist and humanitarian who has already appeared here path leading Alma Mahler and Franz Werfel to safety across the Albères, to work leading refugees into Spain. This work was doubly dangerous as Vierny was Jewish, but despite this she led many groups to safety before being arrested in 1940 by the Vichy police. Although she had been working for Varian Fry without Maillol's knowledge, the artist funded her defense, and she was acquitted and sent for her own safety by the sculptor to pose for Matisse in Nice. But she was arrested a second time in 1943, this time by the Gestapo in Paris while on her way to lunch with Picasso. While in prison she sang for those awaiting execution; in her memoirs she recounts that one young Communist waiting to be shot asked her to sing one of Edith Piaf's chansons through the cell window - she never saw his face. 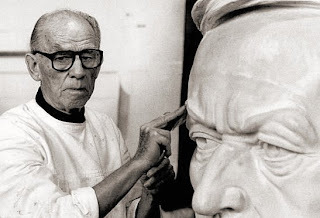 Vierny was held by the Gestapo for six months, and, again, her release was procured by Maillol, this time by appealing to Hitler's court sculptor Arno Breker (1900-91) - in the photo below Breker is seen with his head of Wagner in 1985. Aristide Maillol was killed in a car accident near his studio in 1943, and Vierny went on to a successful career as a collector and exhibitor of works by dissident artists, and as a curator and champion of Maillol's art. In 1959 she returned to the USSR and started collecting resistance songs from Stalin's era; these were recorded by her on the album Chants du Goulag in 1975 - listen here. Our chance exploration of the path up the Col de Banyuls uncovered the story of a truly remarkable woman. This brief portrait of Dina Vierny only scratches the surface of her extraordinary life, and, particularly in view of the enduring interest in Alma Mahler, she deserves to be much better known. Also on Facebook and Twitter. Arno Breker photo is via Museum Arno Breker, Berlin. Header and footer photos are (c) On An Overgrown Path 2013.